..Wee Memories..: Girly Girl Blog Hop with DeNami Designs!! Girly Girl Blog Hop with DeNami Designs!! EDIT: This was supposed to post this morning. I have been gone and just got home to realize it didn't post. I had it set up to go live but for some reason blogger didn't post it. Ugh. So sorry for the confusion! Hi Everyone! Happy Mothers Day! Hope all you Moms, Grandmas, etc have a wonderful day!! Im so excited today is the DeNami Girly Girl Blog Hop! Im so excited to be a part of all the fun!! Here is my card I would like to share with you today! Living in So California this stamp is perfect! We love surfing and the beach!! On my card I used Surfer Mimi from DeNami Designs! Love her! If you started on my blog, be sure to start at the beginning of the hop HERE. You can also check out all the details there. Be sure to comment on each blog!! Your Next Stop on the hop is Julie Ranae! Super cute clean and simply layout! I started singing a Beach Boy song when I saw your adorable card. Thanks for sharing. Adorable indeed! Love the sand! love the card simple but very cute!! Such a cute card, Jenny! You totally rocked those Copics on Mimi- she looks so realistic! So glad you were able to join us for the Girlie Girl Blog Hop! I love this card! So girly and cute! I have to get some Mimi stamps now! Great CAS card! I LOVE the sand effect! So cute! Perfect for summer! Thanks for sharing! Awesome CAS card! Lovin' the little sand mound you created for Mimi to stand on!! Love the coloring on this! Very cute card. I love your sand!! How you cut those legs and arms are beyond me! It makes the card though. Thanks for sharing. Cute CAS card! EXCELLENT cutting on Mimi! Wow! Clean and simple ~ great concept! Perfect stamp for a CA. girl! GREAT job fussy cutting her out, looks fab! So clean and simple! 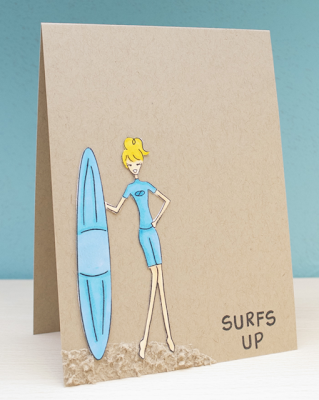 The surfer is very catchy which made the card look awesome!